This is a great way of making a spectacular cake without having any cake-decorating skill whatsoever! 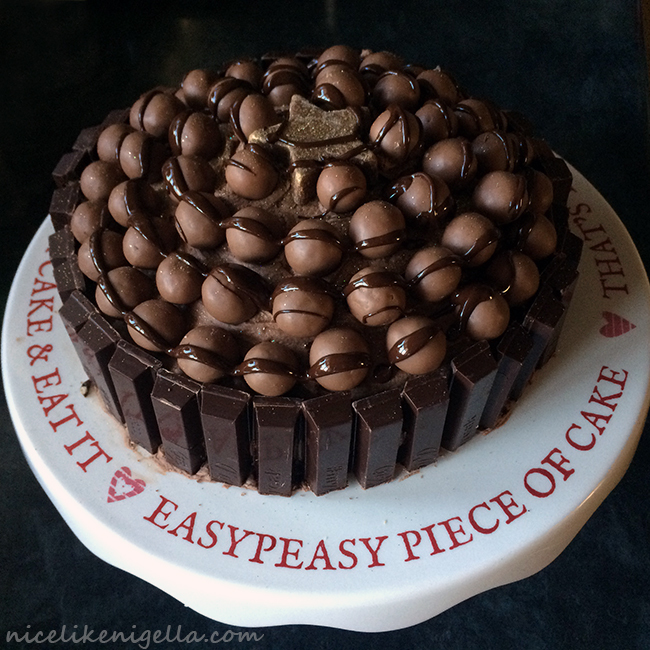 The version I made is a child-friendly version decorated with maltesers and kit-kat fingers, but you could just as easily make a sophisticated version with Lindt chocolate balls and chocoate fingers instead! 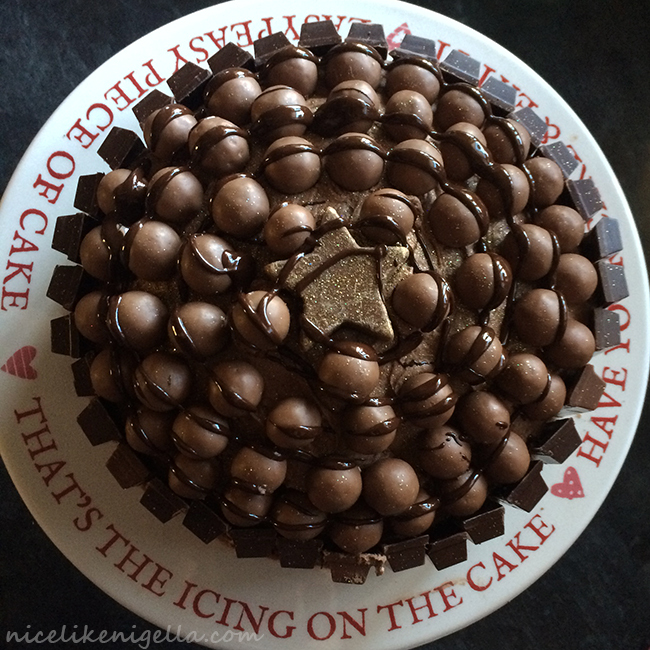 It’s a really basic chocolate sponge cake, covered in chocolate buttercream and then covered in chocolate – what could be nicer, plus it looks amazing! Cream together the butter and sugar, then beat in the eggs one at a time. If the mixture splits don’t worry, it will all come back together again when you add the flour. Mix in the flour, cocoa and baking powder then tip into a deep 7″ cake tin and bake for 40 minutes at 180 degrees. If you want to split the mixture across 2 x 7″ tins then bake for 20 minutes instead. The cake is cooked when you can push a skewer into it and it comes out clean. Beat together all the ingredients with an electric whisk until light and fluffy (start off slowly so that the icing sugar doesn’t shoot everywhere, then turn up the speed once it comes together). Then cover the sides and top of the cake with a fairly thick layer of buttercream 1/2 – 1cm. You will also have enough left over to sandwich the cake together if you made 2 seperate cakes. Then split your kit kats into fingers use a sharp knife to cut rather than break, then cut each finger in half. Stick these in the buttercream around the edge. 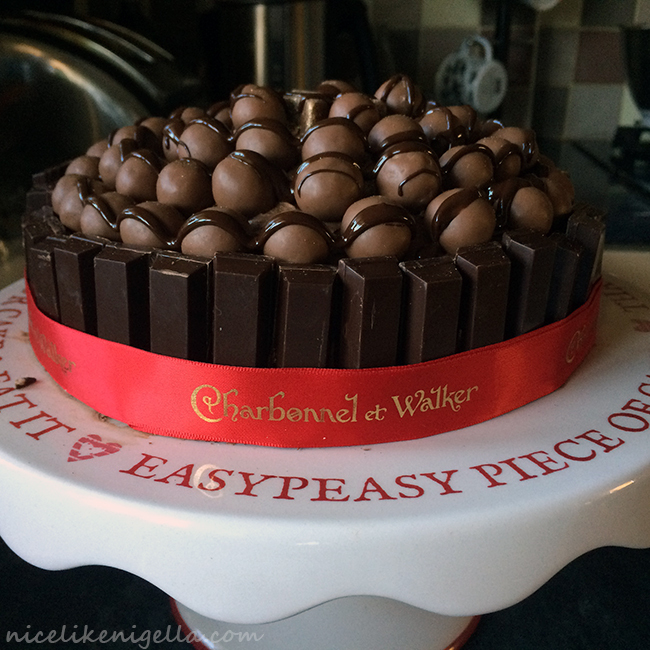 Then add cirles or a spiral of maltesers and voila! You’re done! I finished mine off with some edible glitter, a chocolate star left over from Christmas and some melted cholate drizzled over the top. If you’re using a ribbon, overlap it around the base then fix in place with a pin.